*Regional statistics are based on attendees identifying the region that they currently live in during the registration process at each ICANN Public Meeting. **Additional ICANN Public Meeting statistics and technical data can be found here. Please select tab to see respective data in more detail. This chart reports the number of new users signed up to ICANN Learn within the time periods shown above. This chart reports the number of learners who have completed five or more courses in the time periods shown above. **The spike in new users for FY19Q2 is related to the deployment of the ICANN Account single sign-on (SSO) system. Please select tabs and years of service to see respective data in more detail. Quarterly data is represented by the number of full staff engaged with ICANN on the last day of the quarter. Interns, temporary staff, and contractors are excluded from these headcount numbers. As of FY18 Q4, >15 years of service was added to the chart, and >10 was changed to include those with 10 to 15 years of service. Please select time period to see respective data in more detail. Targets take into account the various events at ICANN. Please select region to see respective data in more detail. 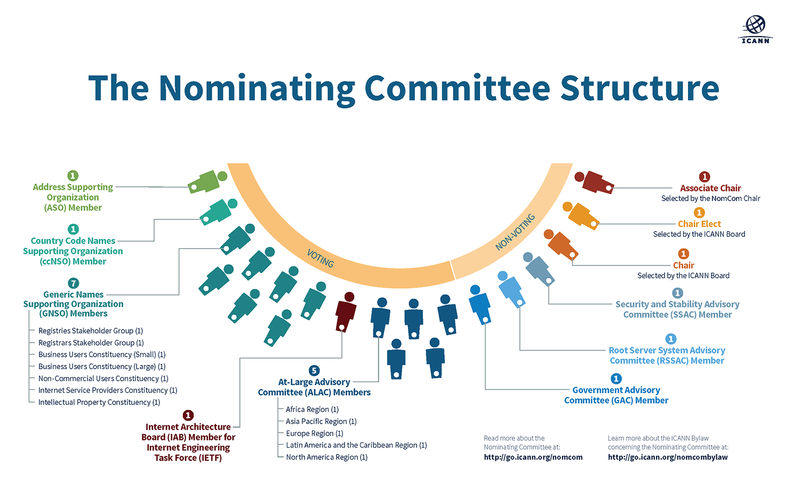 The President and CEO, though a voting member, is not included in the chart as according to the Bylaws, the position does not represent any individual region. Liaisons are non-voting members. They shall serve terms that begin at the conclusion of each Annual General Meeting (AGM). A Liaison may be reappointed, and shall remain in that position until a successor has been appointed or until the Liaison resigns or is removed in accordance with the Bylaws. Please select fiscal year to see respective data in more detail. The onboarding courses for the new Board members consists of best practice trainings, courses directly relevant to their role as ICANN Board Directors, and two mandatory courses required by the State of California. Individual training depends on skill gap analysis. Please select region to see member data in more detail and click here to see Nom-Com structure and acronym definitions. * Damon Ashcraft - served 2016 - 2017 representing the Intellectual Property Constituency (voting member) and 2018 as Chair Elect. ** Cheryl Miller - served 2017 - 2018 representing the Commercial and Business Users Constituency (Large). ***Zahid Jamil - served 2015 - 2016 representing the Commercial and Business Users Constituency (Small) as voting member, 2017 as Chair Elect, and 2018 as Chair.